Anybody been targeting pout on Bemidji? 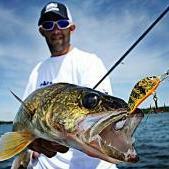 Or catching them when fishing walleyes? Travel has made 'pout chasing tougher this year. I haven't been out to any of my hotspots yet, and usually by this time of year we're in full swing. We've been seeing some in the rentals during the middle of the night however, so they're out there and biting! If you can get out to Grassy or some of the better humps, you should do well! caught one Sat. evening at about 5:45pm, thought it was a log I snagged or something. I wanted to make sure I didn't hit the bottom of the ice in case it was a big wally, so I was being real careful. After clunking the bottom of the ice 3 times , and wondering why since I had it lined up right, finally after getting it into the hole did I realize the 8 inch hole was just barely big enough for the football I was trying to land. I don't know how big these things get but this one weighed 5.5lbs. My boys sure got excited about it, first one I've caught since I was about 12 or 13. And I wasn't targeting pout, just for the record. Your not supposed to target pout...if you did, you'd never catch one. Buck, you get that one in our house? Woodman's house. Haven't fished out of your house...yet. Any other lakes right around Bemidji that are decent for pout? As for size, 5.5 lbs. is a pretty common 'pout on Bemidji. We caught a ton last year, and the biggest were 33-34" long and probably 8-10 lbs. Breuer- what about the one in your FB album, that thing has a giant head! I am going up to Cass the last wally weekend sleeper shack out of cass lake resort. How far off the bottom would I want to be? mmmmmmmmmmmmmmm pout! I don't think you want to be more than a foot off the bottom. Holy hanna! As big as the LOTW pout but relatively attractive with those spots. They are the greatest fish that swims. If I ever caught one ten pound plus I would love to put it on the wall. It is kinda "perty" with those spots, and they are most fantastic to eat, but to mount one--not sure about that one. To each his own though. Hopefully Bemidji is all froze up. Im planning on trying to get out to grassy tonight! Any suggestions on how to find it without a GPS? Haha hopefully the old jiffy is up for that tonight as thats what I might have to do. Im kind of hoping somebody is out there or has been already so I know where to start. So did you make it out there lungdeflator? We made a quick run last night to check ice conditions on some of our favorite humps, and also ventured out to Grassy to see how the ice looked out there. Before heading off the lake we fished for a bit, probably actually fished for roughly an hour or so. Caught 3 'pout and lost one. They were very muddied up, so they should be active from here on out! Yea made it out Friday night for about 4 hours. fished 5-9 and only caught a couple perch. I havent really done this before so I didnt know exaclty what to do. We found grassy and set up in 27 fow on the NW corner. Then at about 7:30 we moved into about 16 fow. We were using buckshot rattle spoons tipped with 2-3 crappie minnows and one deadstick. Glowed all the lures up about every 15-20 mins. So I dont really know what else we couldve done. Sounds like you did everything right. Actually that NW corner is pretty good, but a little steeper, so you could've gone deeper. 32-34' of water. Sounds like you were doing everything right though! They'll become more active soon. We spoke to some guys when we ran out to Grassy last night and they hadn't caught or marked a 'pout. Grassy gets hit hard when they start moving, so look for other humps and you may increase your odds. Dang I had some holes ready out in 35 FOW too! But ok thats good to hear. I think we are going to try again this weekend. How late do you guys stay out? We started at 5 last time, should we wait a little longer?